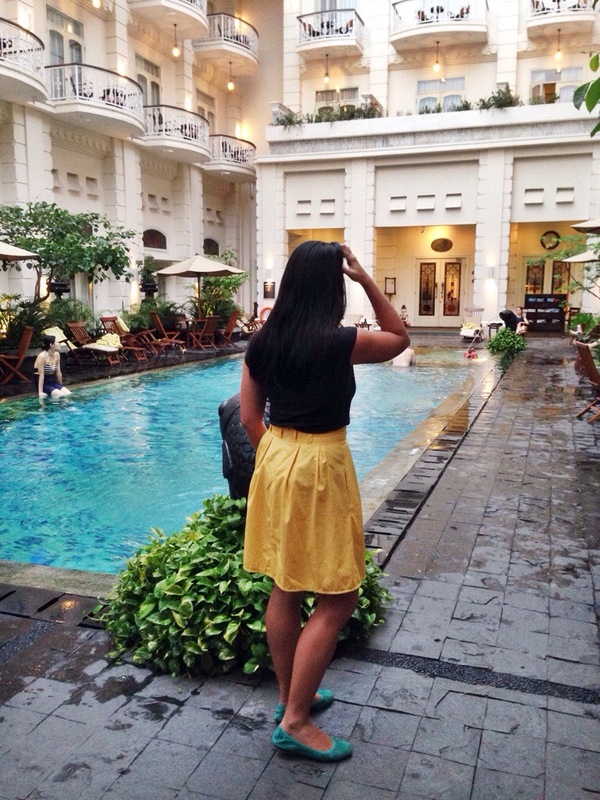 We are currently staying at the beautiful Phoenix Hotel in Yogyakarta, Indonesia so I took advantage of the gorgeous backdrop and dragged my friend out of the poolside to take some photos. And what’s a holiday without some fabric shopping? 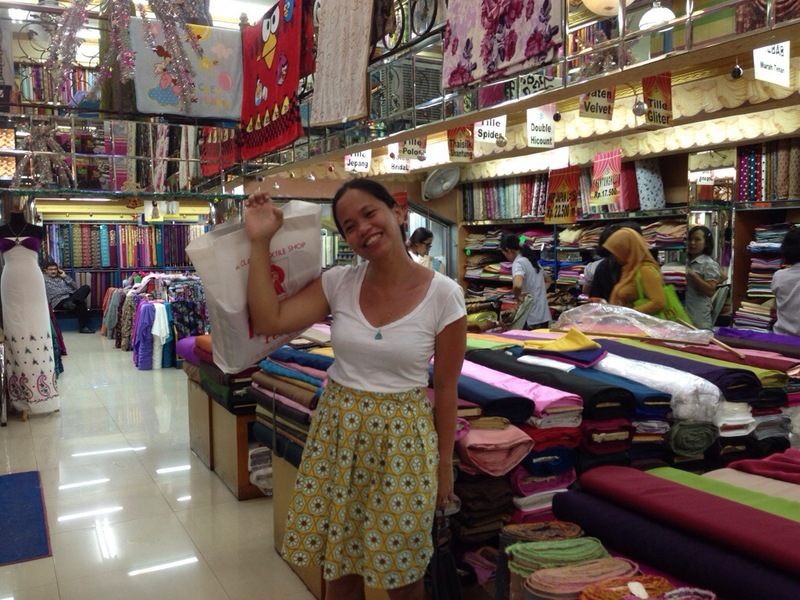 Yogyakarta was brimming of fabric shops! 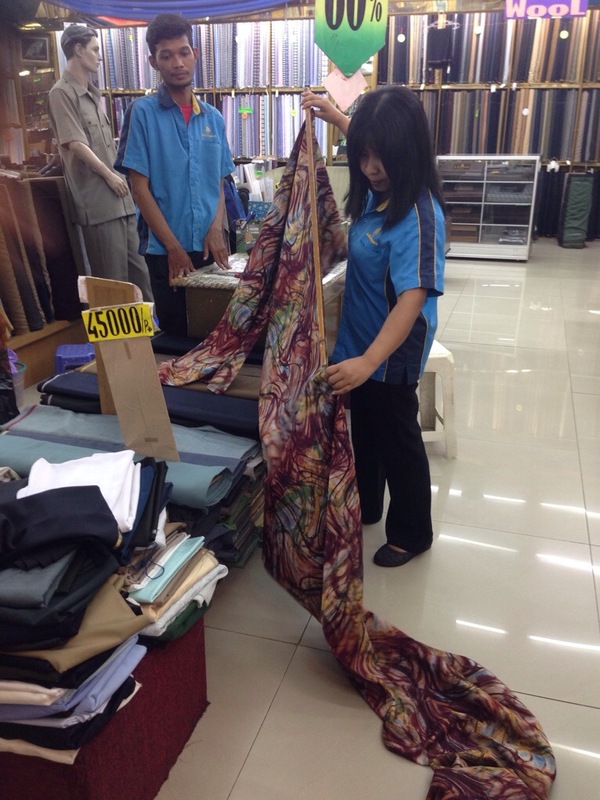 That’s my fabric they’re cutting at 5sgd a meter. 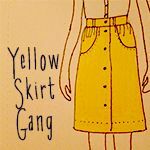 A few weeks back, Alex formed the Yellow skirt gang so we can all sew up our dream yellow skirts together. 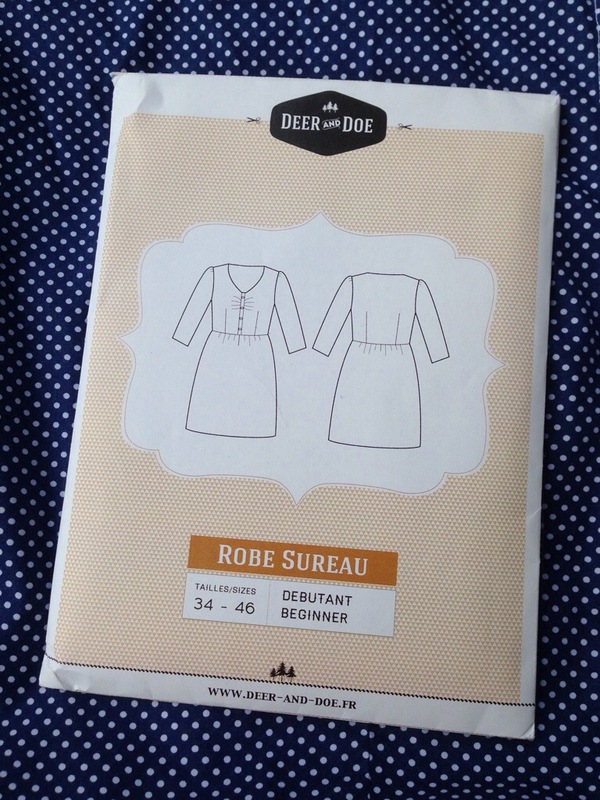 I was hoping to make a mustard linen Deer and Doe’s Chardon skirt like Paunnet’s or Roobeedoo’s but I couldn’t find the right mustard shade that I wanted so I told myself while I am still looking for that elusive mustard, I can sew up a printed yellow skirt first. The fabric is Dancing Harvest in Wheat from Art Gallery Fabrics’ Bijoux Collection which to me looks like a bunch of half grapefruits. 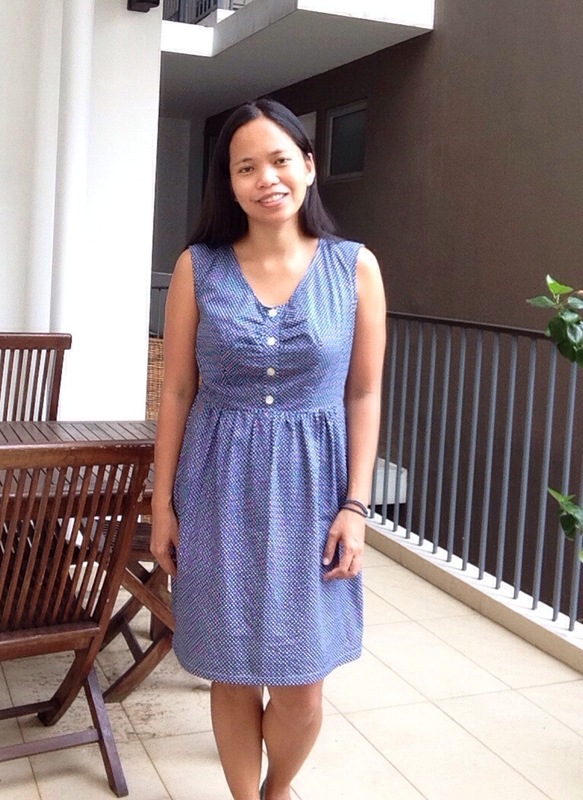 I ordered 2 yards for 21 dollars from an etsy online shop Laughinghousefabric based here in Singapore (Yay! Super cheap shipping cost at last). 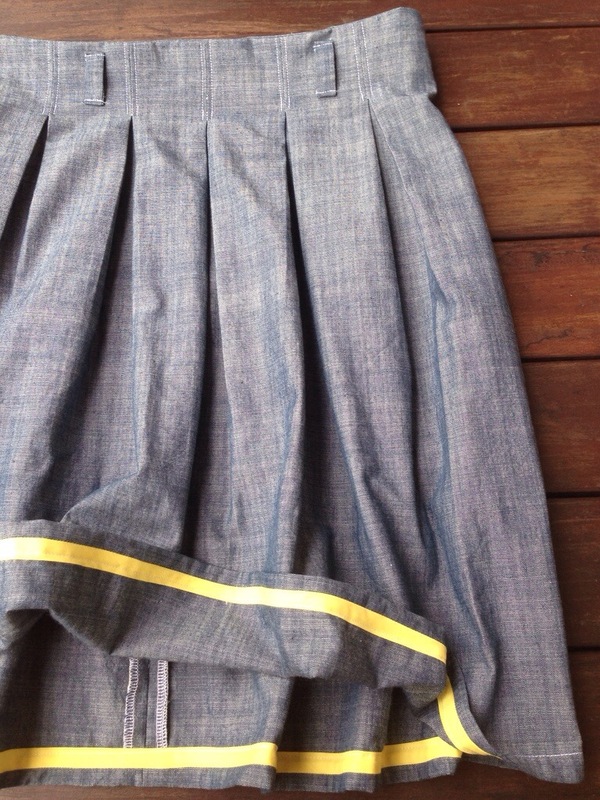 My first Chardon’s waistband facing turned out much longer than the skirt’s waist, so this time I took my sweet time and marked all of the inverted box pleats markings with a tracing wheel and carbon paper. 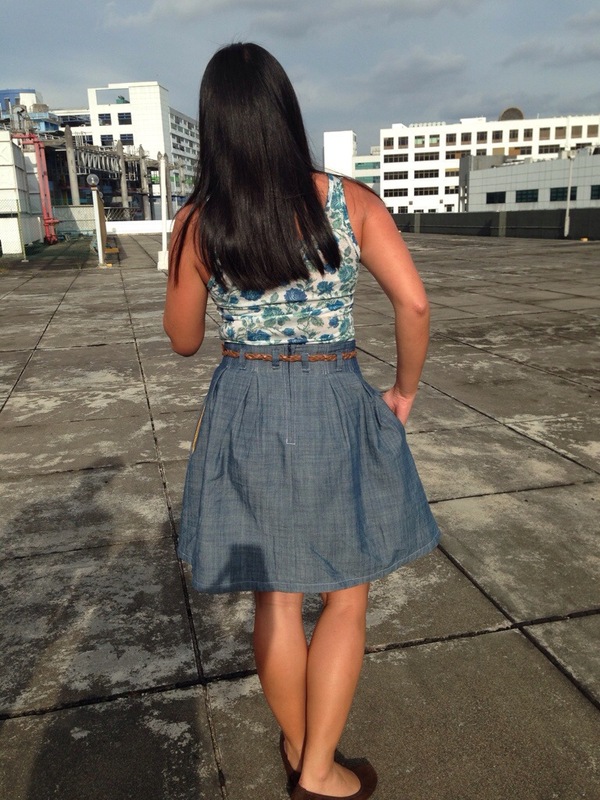 It paid off because this time my waist seams matched perfectly! Also, sadly after washing my first Chardon in the washing machine, some of the belt loops were starting to unravel as well as the bottom tips of the inverted pleats. So for my second Chardon, I reinforced the box pleats and belt loops by doing lots of backward and forward stitches. I didn’t have a yellow zipper so I watched this video and read this post countless times, and it helped so much in installing my first invisible zipper. Whew! 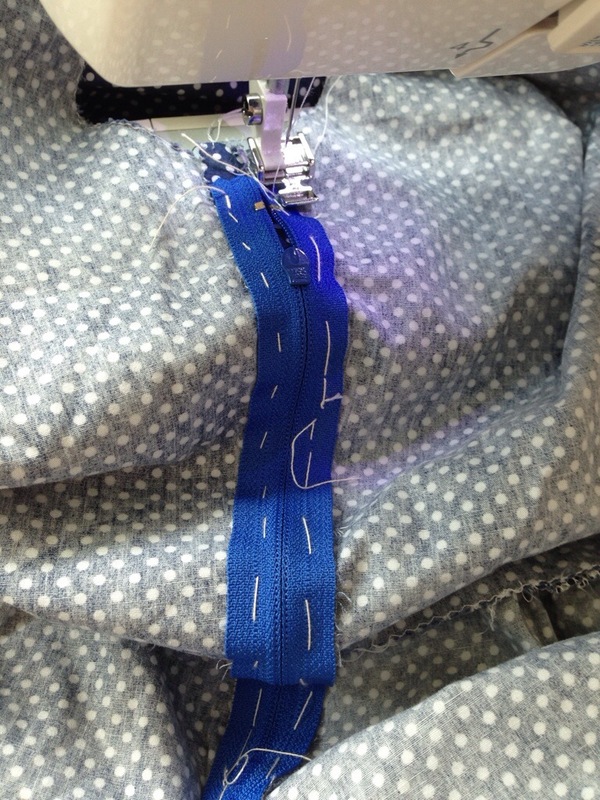 If I only knew it was this easy, I should not have avoided so many patterns with zippers in them haha, I was surprised it was even easier to install than the centered zipper. 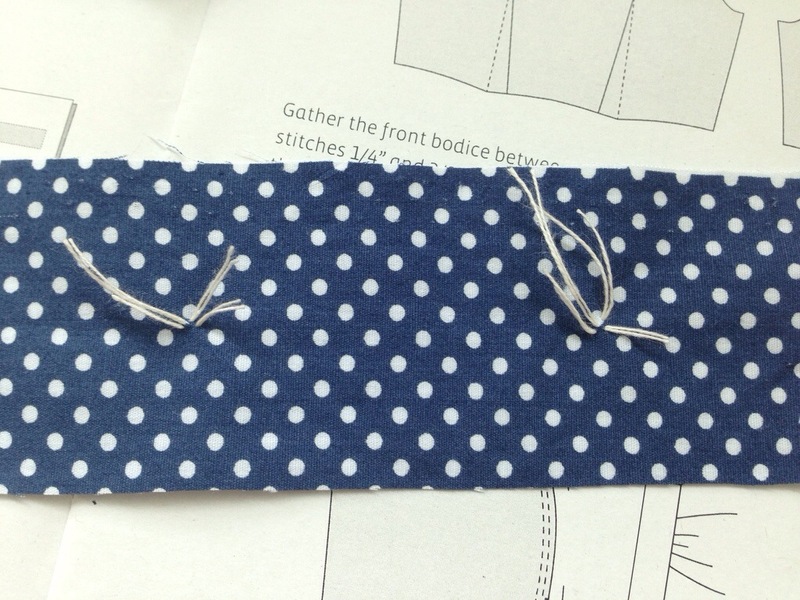 Lucky for me, the Auntie who sold me my sewing machine gave me this invisible zipper foot for free. 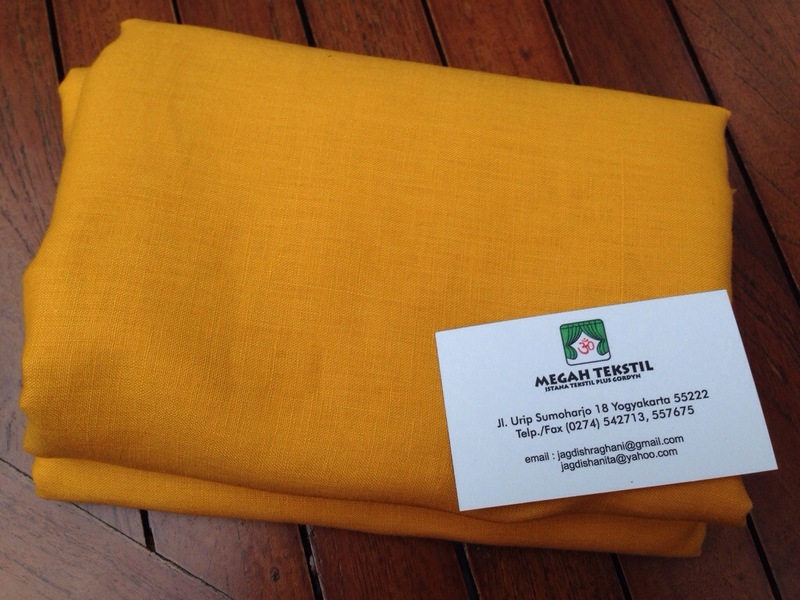 I also finally bought some labels for my handmade clothes, I saw them first from Roobeedoo’s yellow skirt and I really loved them! 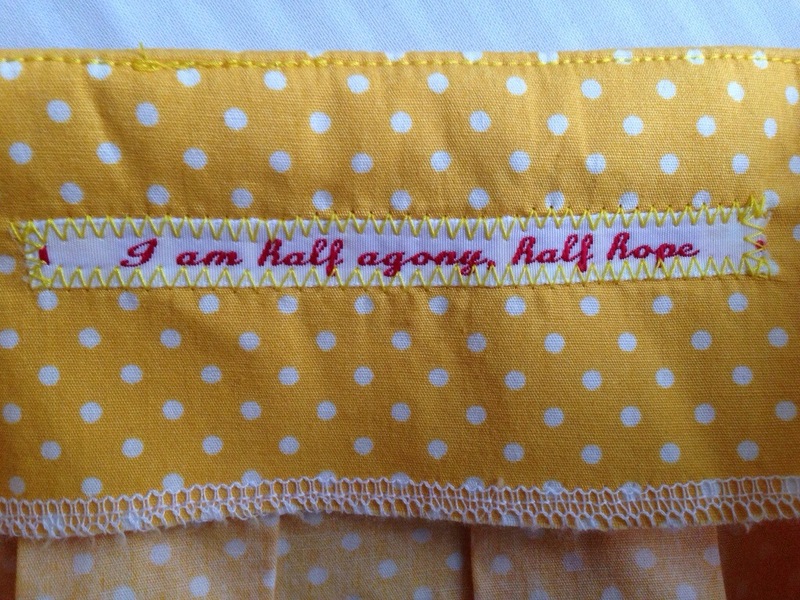 Until now, Wentworth’s letter to Anne still kills me so “I am half agony, half hope” it is. Anyway, that’s how I feel sometimes when I’m unpicking stitches in the middle of the night haha. Oh, and I got them from Scrapiana who lives in Bath! She’s really nice too. 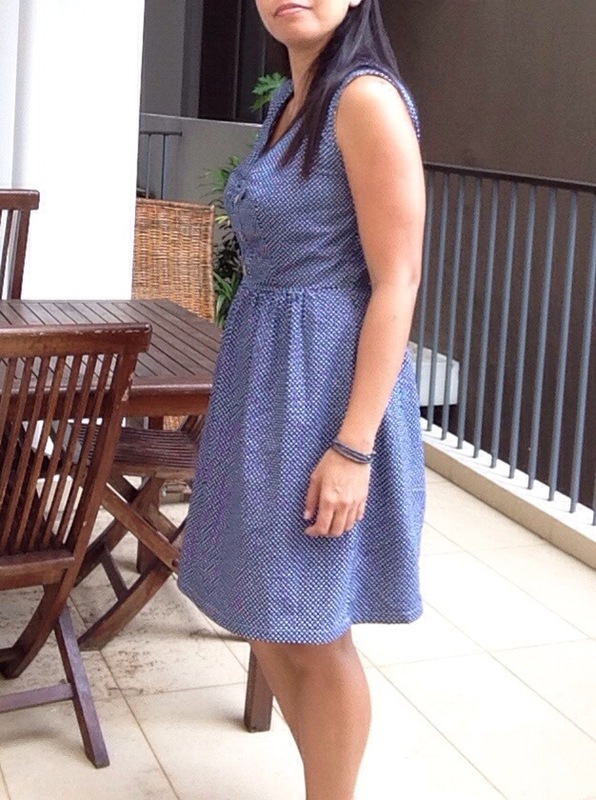 It took me over a month to finish this dress. I chose to make a straight size 40 even though my actual waistline said I should grade to size 42 on the waist. So it was of course too tight when I tried it on and in the end I had to release 1cm each to the back bodice darts and use 1cm as seam allowance instead of 1.5cm for the bodice side seams. The neckline was also gaping so I had to unpick all the neckline topstitching to pinch 1/2 inch from the shoulder seam, after wearing it for a day I realized I might have removed too much because the shoulders look like they’re being pulled down. I’ve never made so much adjustments in making a dress before so I feel I’ve learned a lot. 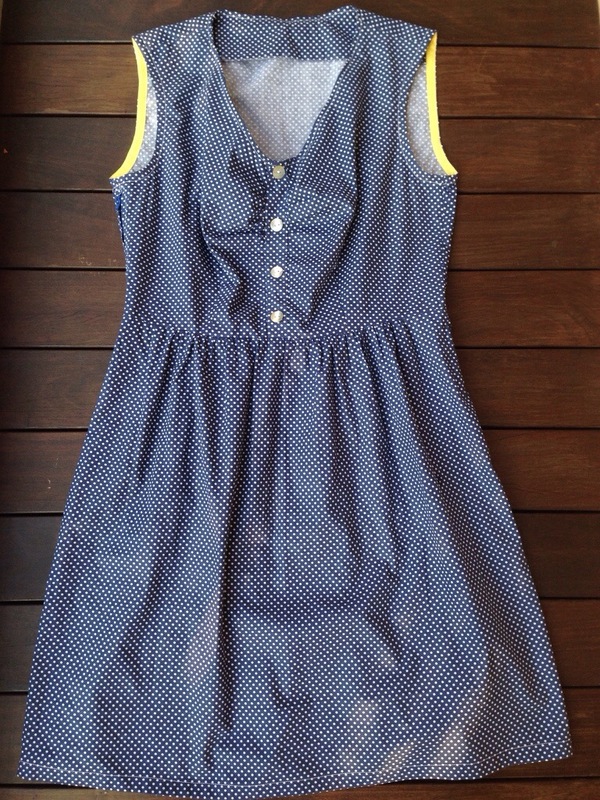 The pattern is Sureau from Deer and Doe, it’s a beginner pattern and I made the sleeveless version. 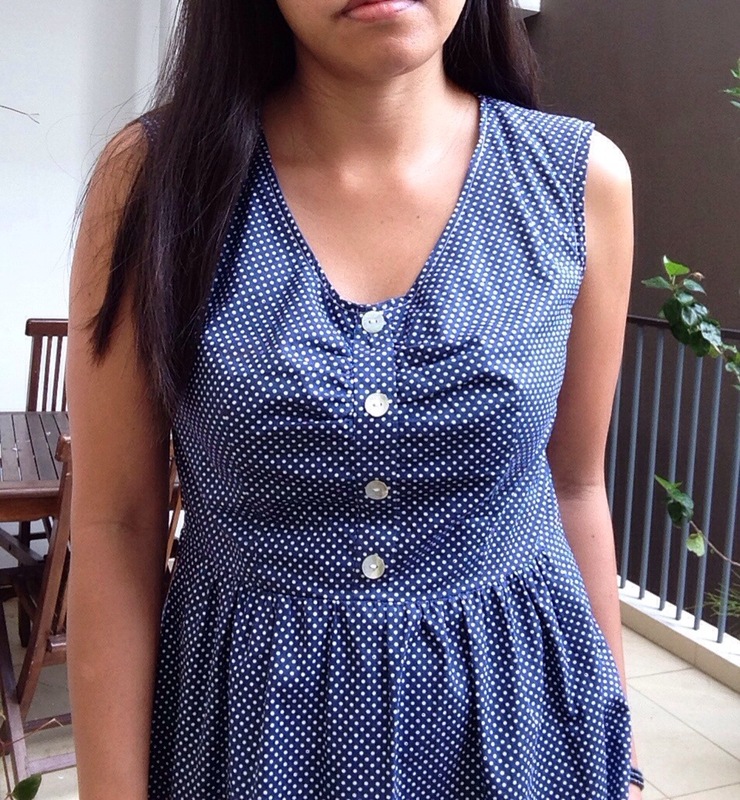 The fabric is a navy polka dot 100% cotton fabric I got from Spotlight for 9 sgd a meter and it’s a very easy fabric to work with. I especially love the bust gathers, I wore it to work yesterday and everyday (honestly!) 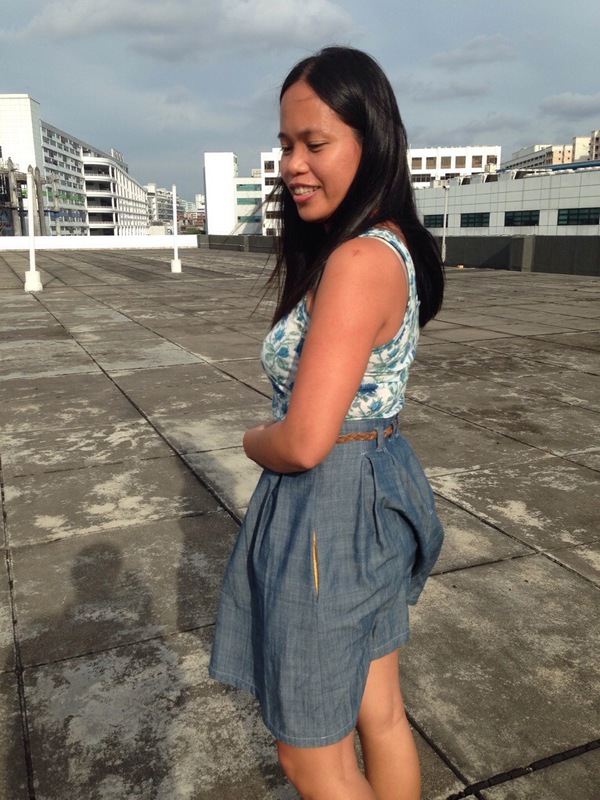 my officemates would ask if I made what I’m wearing but yesterday they didn’t. Or probably they just didn’t care haha. Anyway, have you tried Deer and Doe? I want to get all of their patterns and make them NOW. And I finally got myself a sewing teacher, she’s a Dutch/Kiwi quilt artist who also teaches kids how to sew and I’m her first adult student. She taught me how to make tailor’s tacks, hand baste and install my first ever zipper, wrap my thread tails figure 8 to make my gathers and she showed me never to be afraid in using my unpicker. 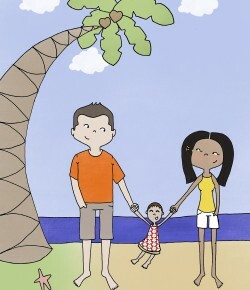 My next project with her is an Archer shirt! It’s just a 2-hour session twice a month but it’s such a treat for me :). 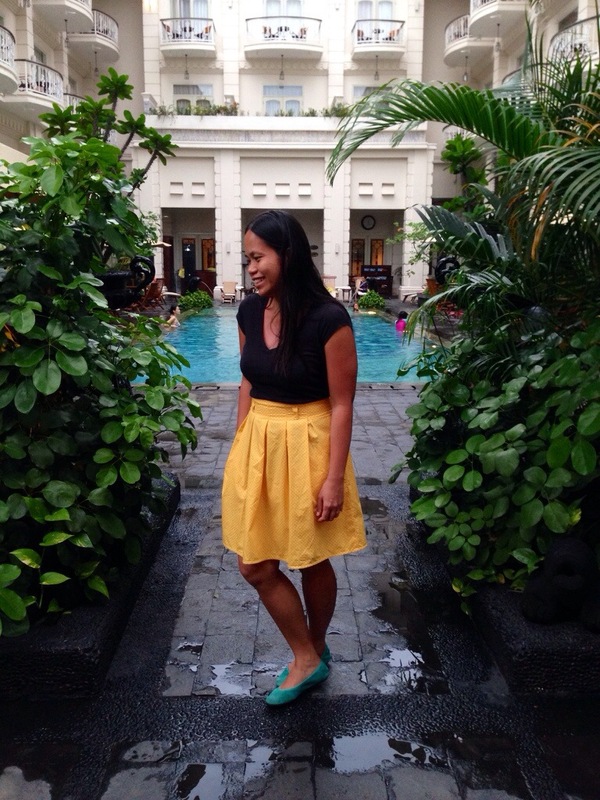 Yellow skirt gang update: Looking for a mustard linen is not easy at all, I’ve been to Chinatown the other day and mustard doesn’t seem to be a popular color in the shops here. 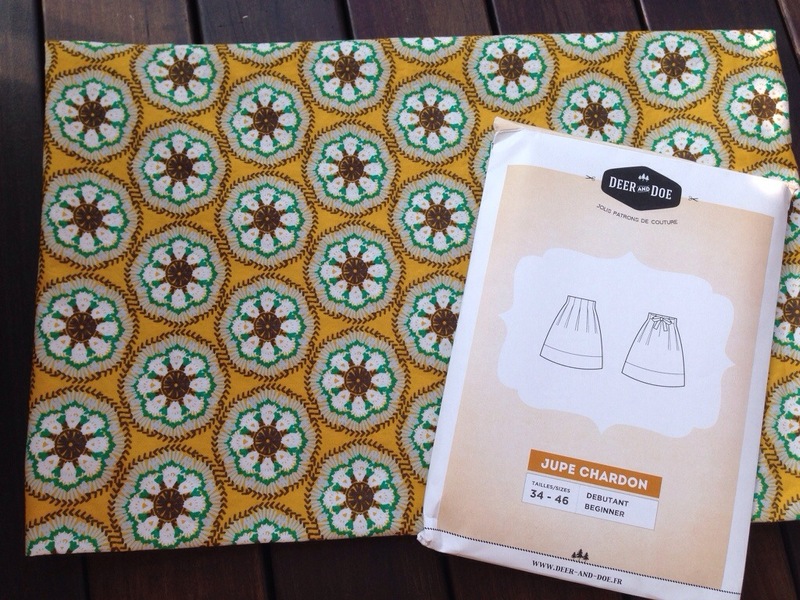 I’ve decided to get a mustard-y print for now from a local online shop and make a Chardon this weekend. 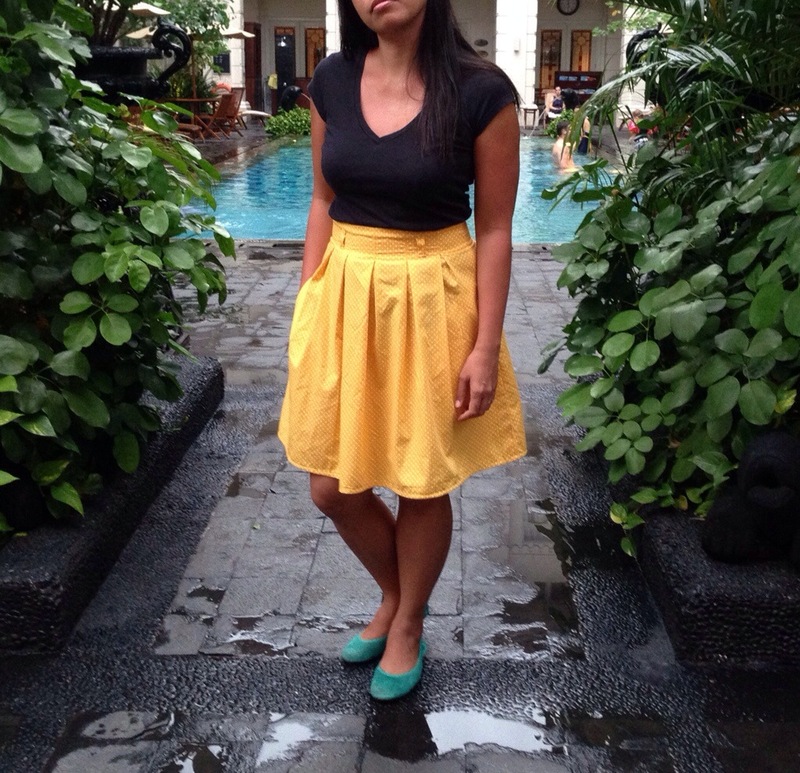 I made a skirt! 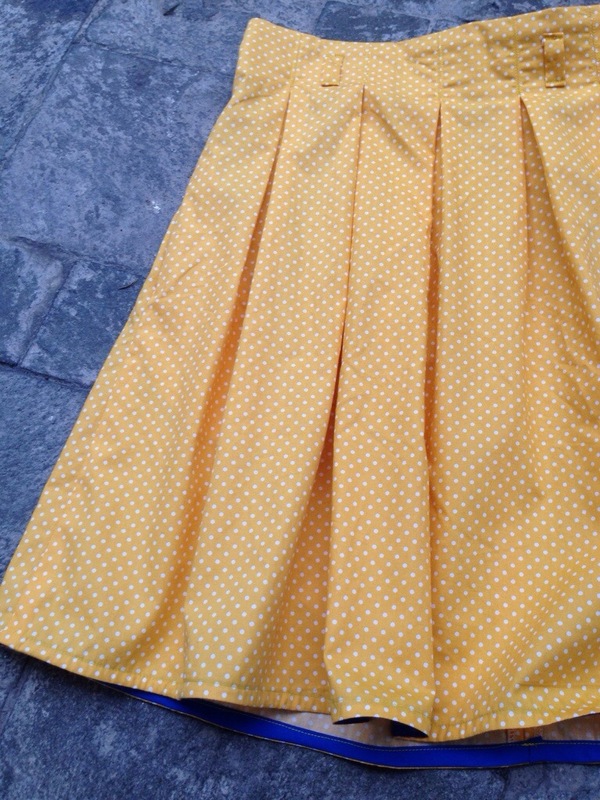 It’s my first ever skirt by the way. 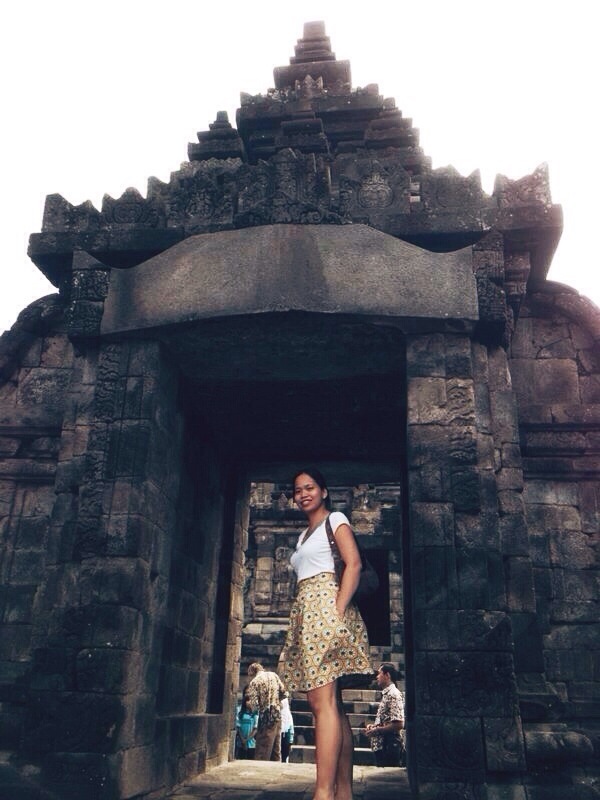 I wear dresses and jeans but never skirts because I don’t tuck shirts in (that’s how you wear skirts, right?) but I thought I’d give it a try. I wore it today at work and I’m very happy with the fit. 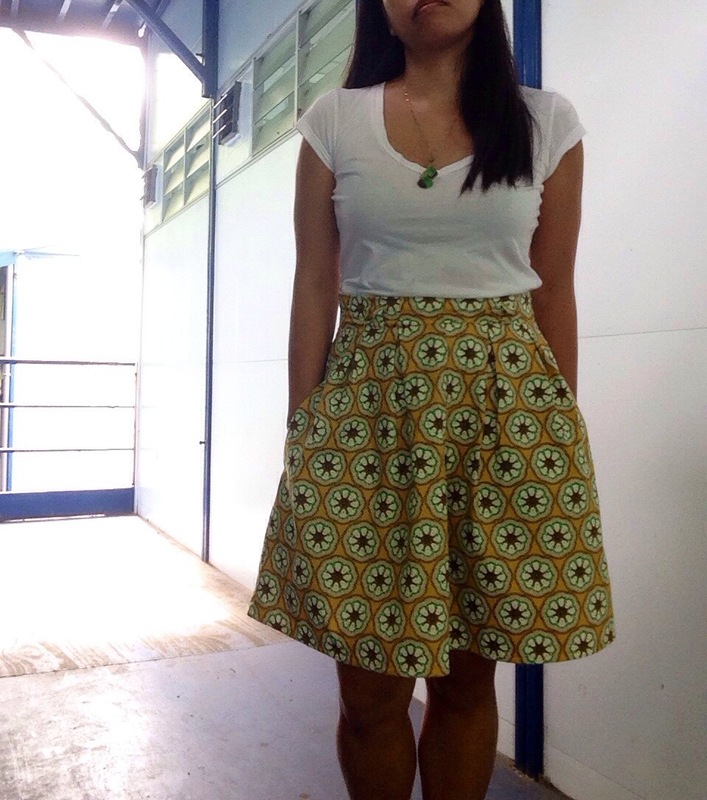 I might just sew skirts from now on actually haha. 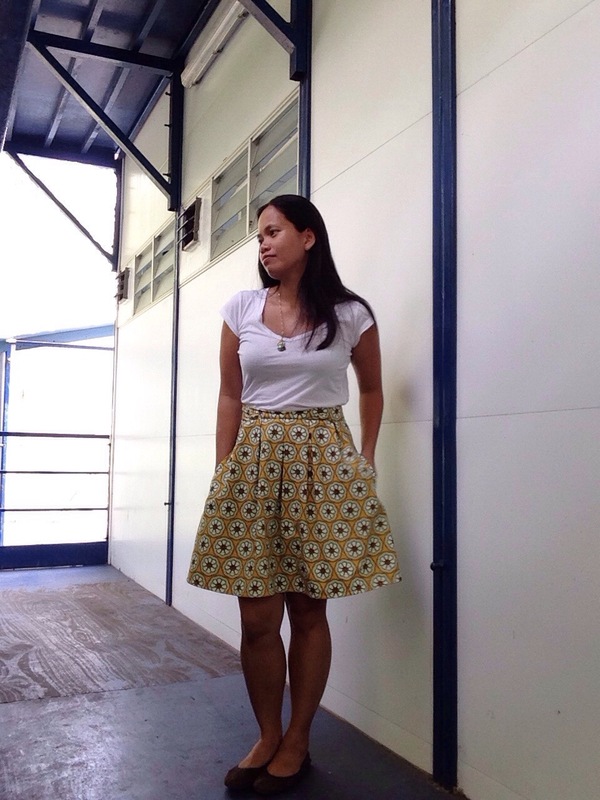 The pattern is Chardon skirt from Deer and Doe, I made a size 42 with length as size 38 and the fit is just right. 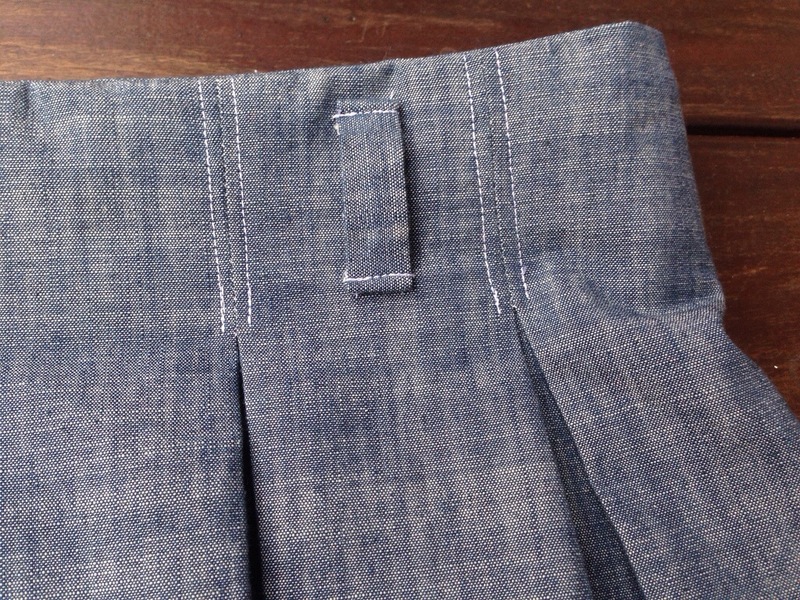 I think I got over excited on sewing the inverted box pleats because when it was time to attach the skirt with the waistband, the waistband was more than an inch longer. 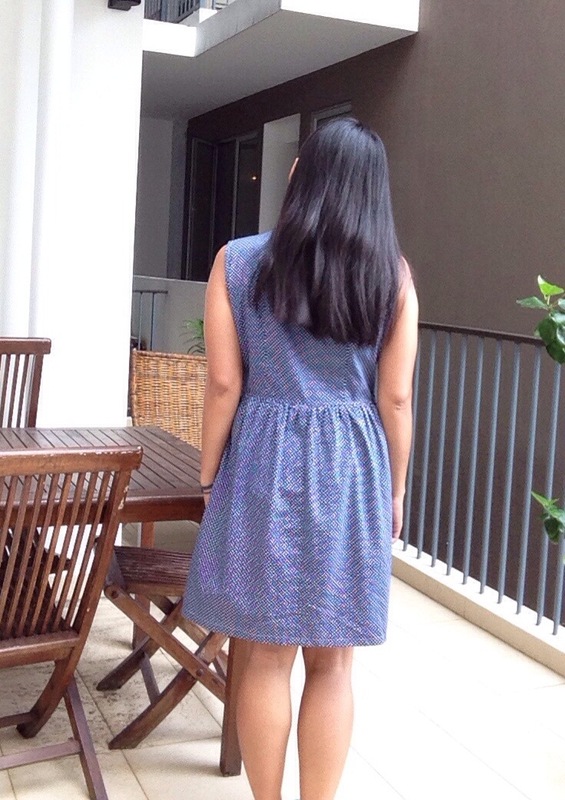 I think it’s an excellent beginner pattern and I’m already planning on my next Chardon with contrasting hem band and ribbon tie at the back. 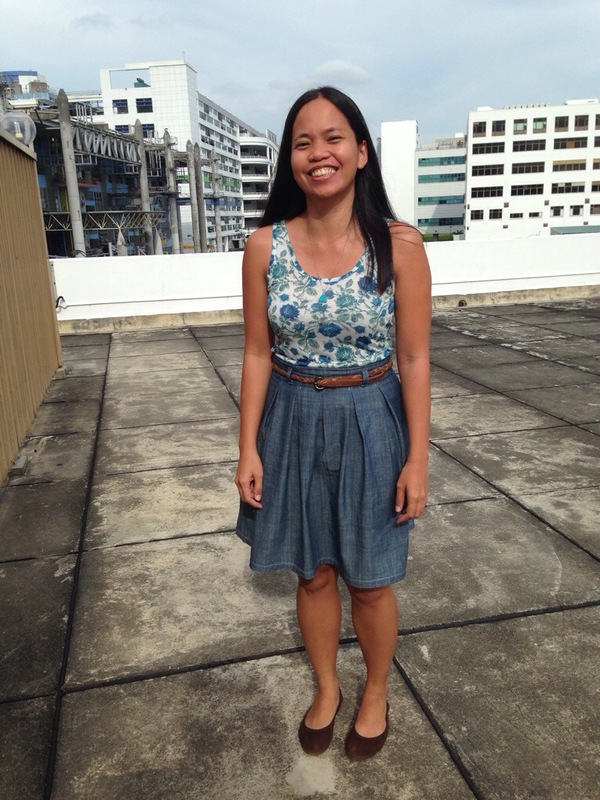 The fabric is a very nice, more of a medium-weight chambray I got in the Philippines for 11sgd a meter, I used less than 1.5 meters of the 60″ fabric and I think I might just have enough left for the contrast hem band on my next skirt. 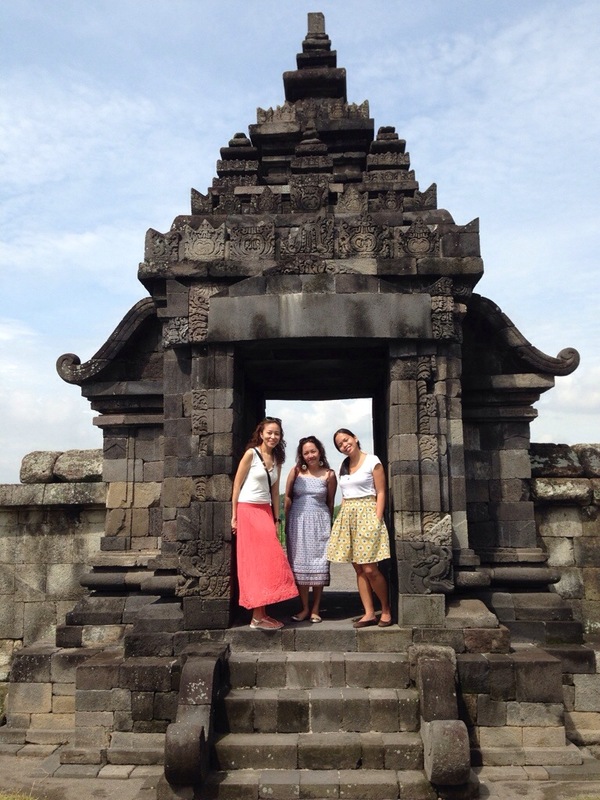 My tea break buddies and I were on our way to the office cafeteria when I asked them to take photos of my skirt. Thanks Joseph for the photos! 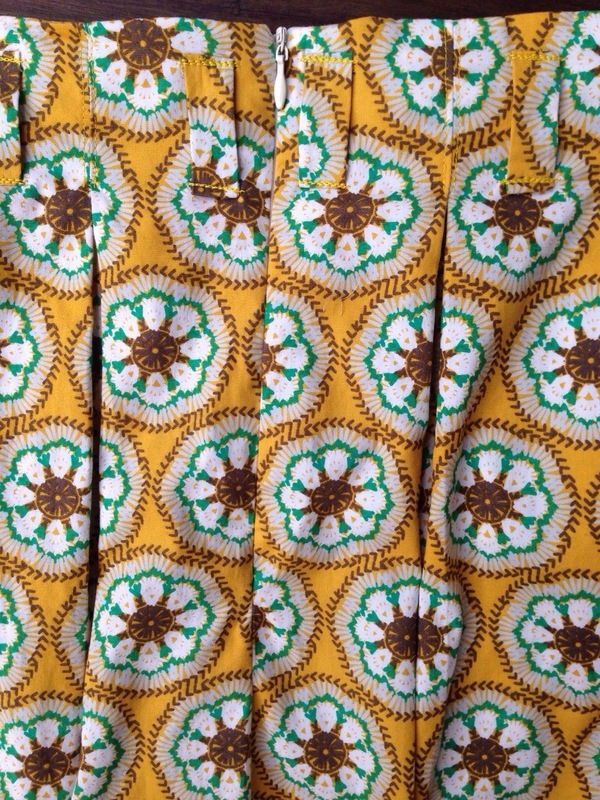 Yellow bias tape for the hem. 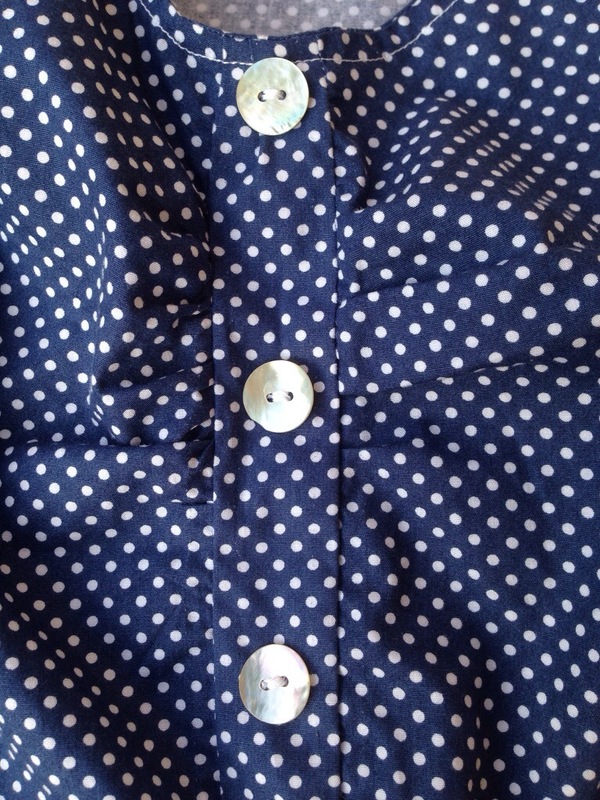 And I used my new overlocker to finish the seams. Well, not really new, it’s a second-hand Brother 1034D I got for 99 quid on eBay on my last UK trip. Well worth lugging it all the way back to Singapore. 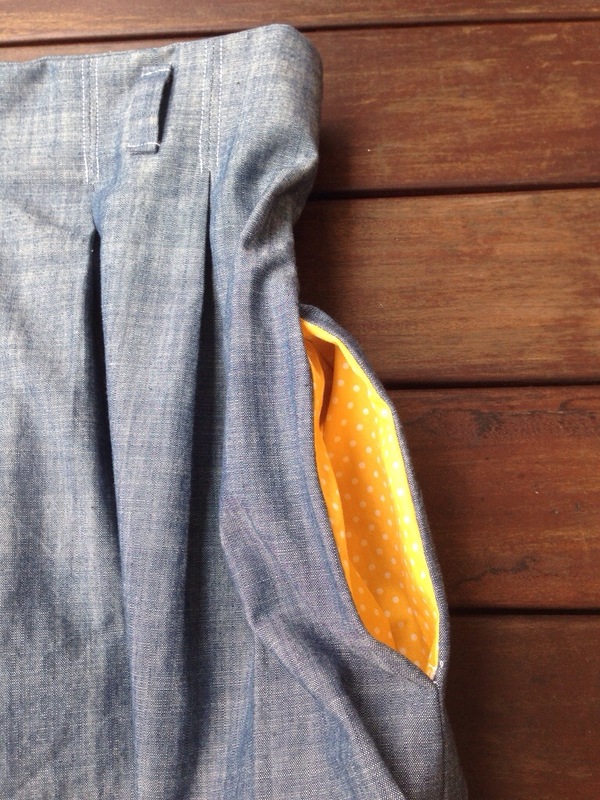 Happy yellow polka dot pockets, and they’re super roomy too. 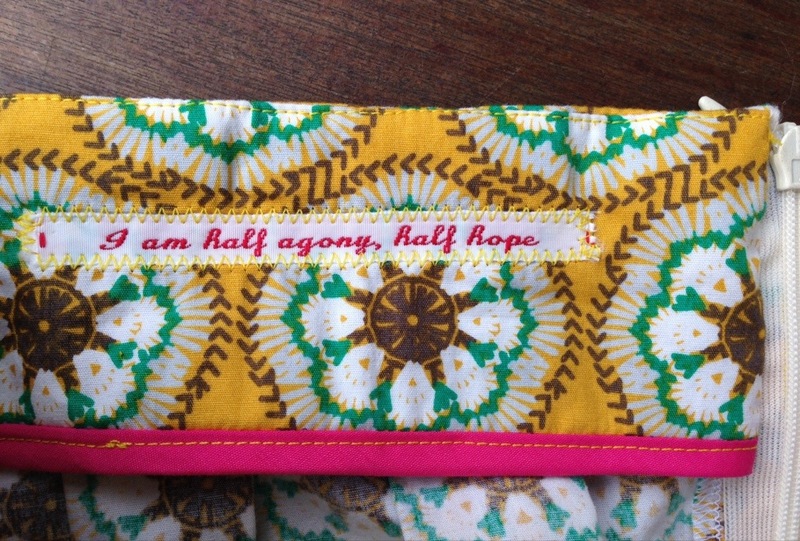 I love these pockets.